1. Preheat the oven to 200°C, gas mark 6. Bake the potato gratin for 30-35 minutes until golden. 2. Meanwhile, pat the plaice dry with kitchen paper and place on a greased baking tray. 3. 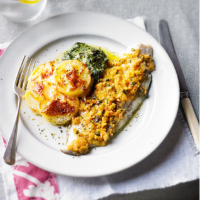 Mix the breadcrumbs with the lemon and herb sauce, capers, chives and 1 tbsp water, season and press onto the plaice fillets. Bake for 10-15 minutes until golden. 4. Heat the spinach mornay according to pack instructions and serve with the fish and potato gratin. This recipe was first published in Thu Jan 15 10:13:43 GMT 2015.